I bought a new spin bike – the Sunny Health & Fitness SF-B1110 of Amazon- recently and really like it. I’ve been getting a lot of questions about it, so I decided to make a video. This bike has a list price of $499, but it was on sale for less than $300 when I bought mine and then I used my Amazon credit card points to get it down to about $150. The seat and handle bar adjustments are easy to make. Once the seat and handle bars are set to fit your body, the only thing you have to worry about is controlling the resistance knob on the front wheel. The seat is slightly less comfortable than lounging in a recliner, so be kind to your behind and wear bike shorts for extra padding. I did not invest in any official spin bike subscription service or gadgetry to track mileage or speed. I simply watch the Global Cycling network on my iPad for my workouts and have been very pleased with the decision use a device I already had on hand. 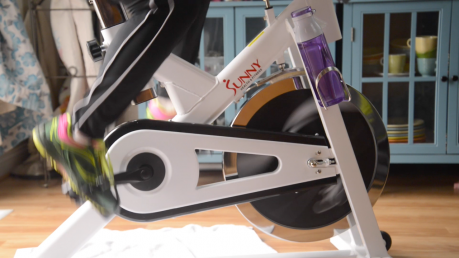 Towels – one on the floor under the bike and one the handle bars – will help catch sweat. I also wear a sweatband or bandana to contain the sweaty mess these spin workouts can reduce me to. I really like this bike. The only thing it’s missing is an extra water bottle holder because sometimes one bottle isn’t enough. Always have water on hand! Not having enough time to workout is a major problem for a lot of people. On days when time is short, I like to do this 20-minute fat burner workout with my cycling friends over on the Global Cycling Network. You can check out that video below. Reading your blog, I found that you are a fashionable, healthy lady, would you interest to write a review for our products?please do let me know. I got a spin cycle, too, partially thanks to your inspiration and Instagram posts. I haven’t looked at the global cycling network site yet. I usually listen to audiobooks or podcasts while spinning, but sounds like the video is really motivating? Thanks again for your inspiration and great sense of humor!